Small Animals: Annabelle tolerates small dogs but her reaction to cats is unknown. 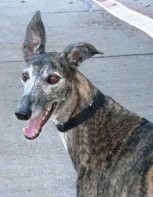 History: Annabelle began racing the end of September, 2006 through the end of January, 2010. She had a longer racing career than many (and without ever having a serious injury) and is ready for a rest. She seems to be easy going and fits in quickly to new situations. Annabelle with a couple of her new family members. Small Animals: Roxie is not small animal tolerant. History: Roxie had a successful racing career until she broke her leg in 2005. She was returned to the farm and sometime later was placed with TAGS. 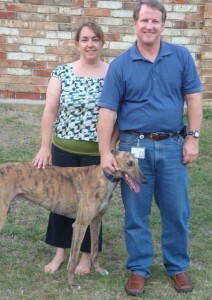 Roxie with her new family. Small Animals: Ringo is small dog and cat tolerant. Ringo with his new family. 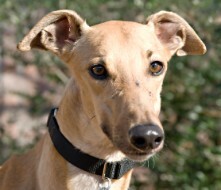 Small Animals: Harry is in a foster home as a single Greyhound but with a small dog. Harry will be tested with cats soon. 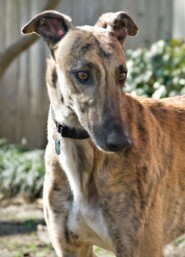 History: Harry came to TAGS' with Jazz and has the honor of being TAGS second Greyhound. Harry and Betsy are littermates. They are descendants of the famous HB’s Commander and Molotov. 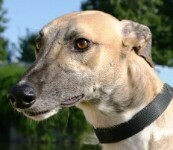 Harry decided 10 races were enough for him and is now enjoying retirement. Harry with his new fur-family members. Small Animals: Betsy is cat trainable and is fine with small dogs too. History: Betsy only has 2 races under her belt and she decided it was time to retire. Betsy and Harry are littermates. Betsy and Maggie are half sisters, having the same sire, Late Late Show. She is a very sweet and cute little girl. Betsy with her new dad. 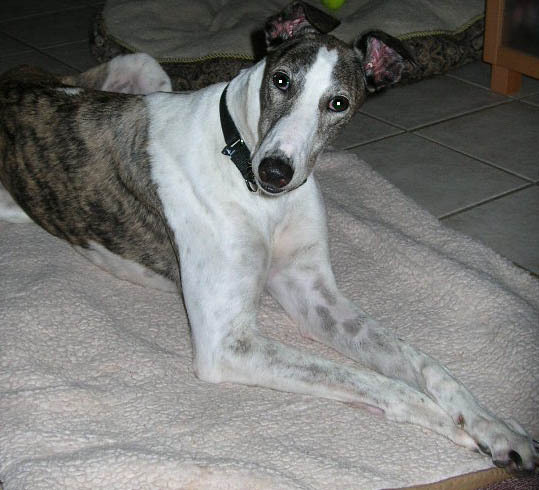 Small Animals: Shawnee's reaction to cats and small dogs is not known at this time. .
History: Shawnee ran 5 races at Gulf Greyhound Park from November 4 to December 6, 2009, but was obviously not very competitive. He would rather live out his life in retirement. He has a bobtail, but the cause is unknown. He is said to be a very easy going guy. 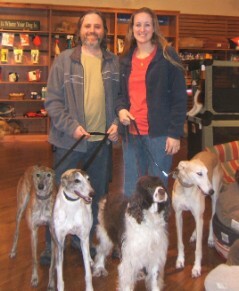 Shawnee (now Shiner) with his new family. Small Animals: Runner gets along well with the small dog in his foster home and had no reaction to small dogs at the vet's office. 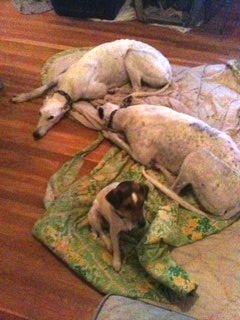 He also is comfortable with other Greyhounds. Runner has not been tested with cats yet. History: Runner began his racing career in February, 2008 and his last race was in November 2009. His racing career lasted just under two years and he placed first only one time. It seems Runner was ready for retirement even before his career began. 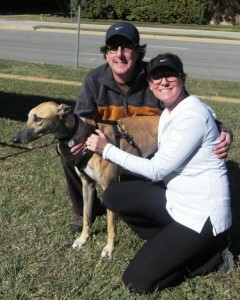 Runner with his new family, the Stokes. 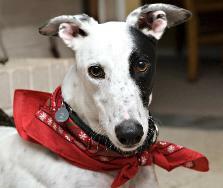 Small Animals: Sybil has not been tested with cats or small animals yet, but will be tested soon. History: Sybil is a North Texas girl. 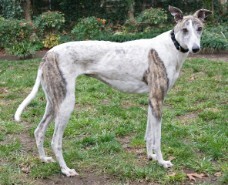 She ran 63 races according to Greyhound-Data.com and finished her racing career at Gulf Greyhound Park. 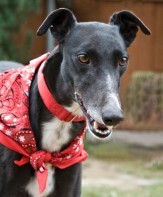 Sybil in now ready to race into someone's heart and live the good life of retirement. 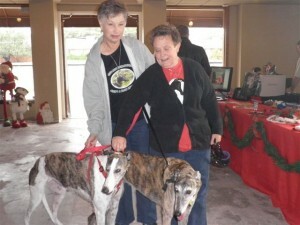 Sybil with her new mom. Small Animals: Jazz cannot be trusted with cats. 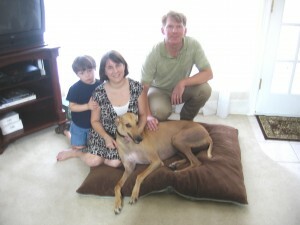 He seemed to be okay with a small dog, but can be tested again after he gets comfortable living in a home environment. 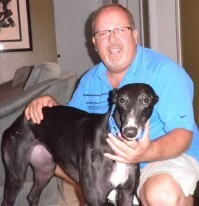 History: Jazz is TAGS' first Greyhound. Jazz ran 84 races but is now settling into retirement. 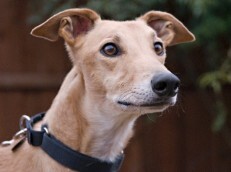 Jazz is a little timid of new things and new people. 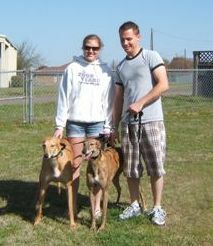 Jazz with his new family including his fur-sister Penny Lane. Small Animals: Maggie seems like she will be cat trainable and she is fine with small dogs. She seems to want to play with cats. 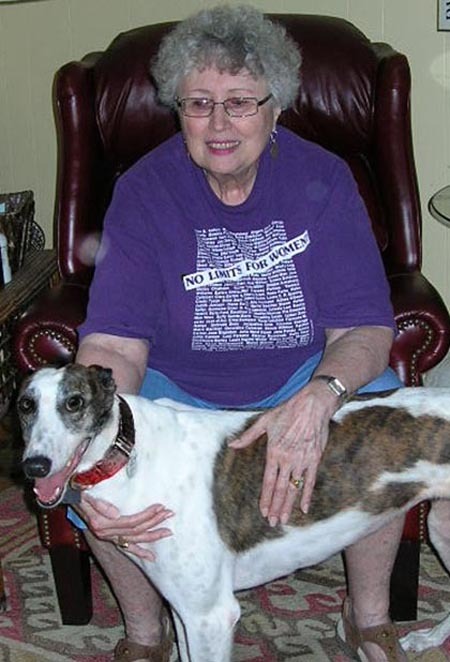 History: Maggie only has 3 races under her belt and she decided it was time to retire. Maggie and Betsy are half sisters, having the same sire, Late Late Show. She is a very inquisitive and beautiful girl. 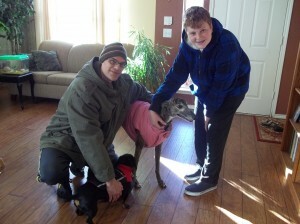 Maggie with her new family including Greyhound sister, Lass, Greyhound brother, Teddy and Springer Spaniel brother, Spike (with 3 kitties and a horse at home). You are on the 2010 page.